A sliding and locking mechanism developed by Speedy, makes it possible to move the wheelchair into the desired wheelbase position using the hand rim. This action is handled by the wheelchair owner themselves, without removing the wheels. A wheelbase adjustment to the rear increases the traction (ground contact) of the tires, thus making it safer. This position is particularly suitable for inexperienced first-timer users, when driving on uneven ground such as grass and gravel, or uphill and downhill travel. 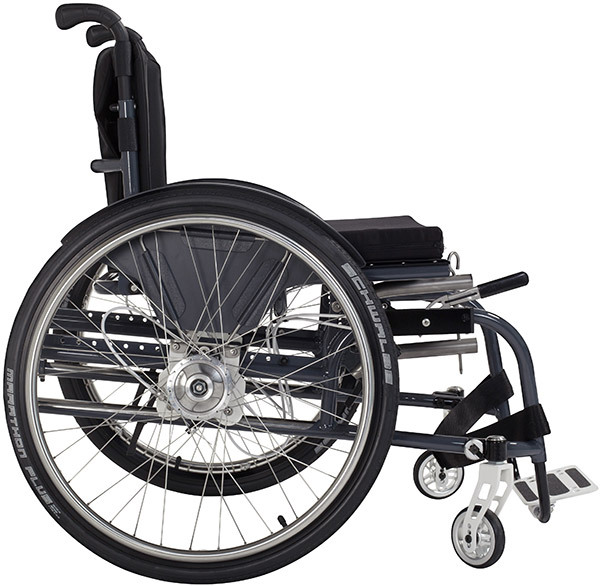 A wheelbase adjustment to the front reduces the overall length of the wheelchair and allows the owner to use cramped spaces such as elevators or public non wheelchair-accessible toilets. However, the short position also offers active driving characteristics in combination with speedy wheelchair towing equipment. The tandem is more agile, rolls better and allows for a higher cornering speed. When driving on uneven terrain, an individually adjustable shock absorber (seat suspension) absorbs the vibrations and thus ensures a virtually vibration-free ride. The Speedy Vamos’s one-handed brakes operate regardless of tyre pressure and wheelbase and even works on wet road surface. So you can reliably brake the wheelchair, even in bad weather. The side panels offer increased protection against splashing water with their increased surface area and remain in their position on the wheel, even after a wheelbase adjustment. This not removes the need for strenuous wheel changing, it also opens up space for getting in and out of the wheelchair.